Volunteers present their work at the Swoop Food Pantry. 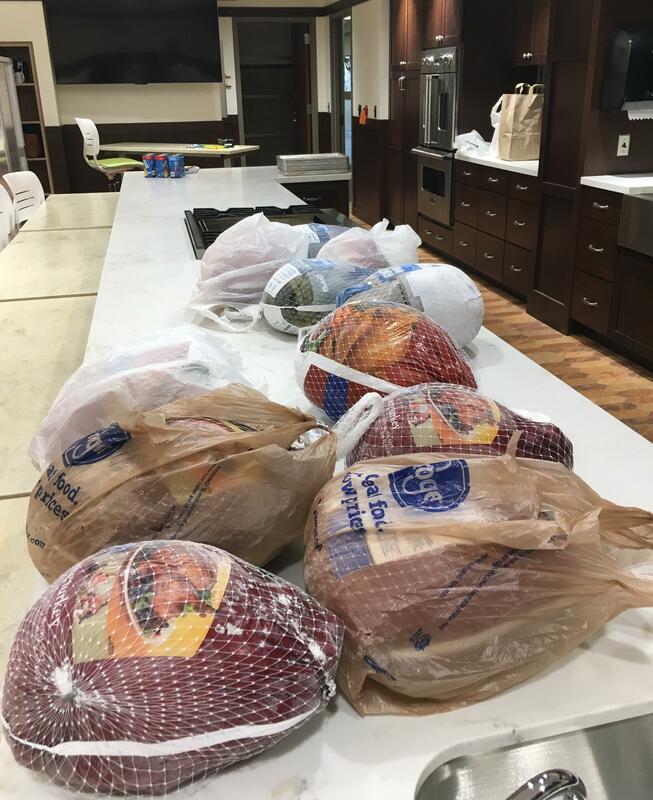 Thanksgiving turkeys at the Swoop Food Pantry. Students preparing food at the Swoop Food Pantry. A student prepares food at the Swoop Food Pantry. A bulletin board with Thanksgiving thoughts. It's Thanksgiving week, and while many families gather for large dinners and celebrations, not everyone is as fortunate. For some college students, it's an even bigger struggle including in Washtenaw County. 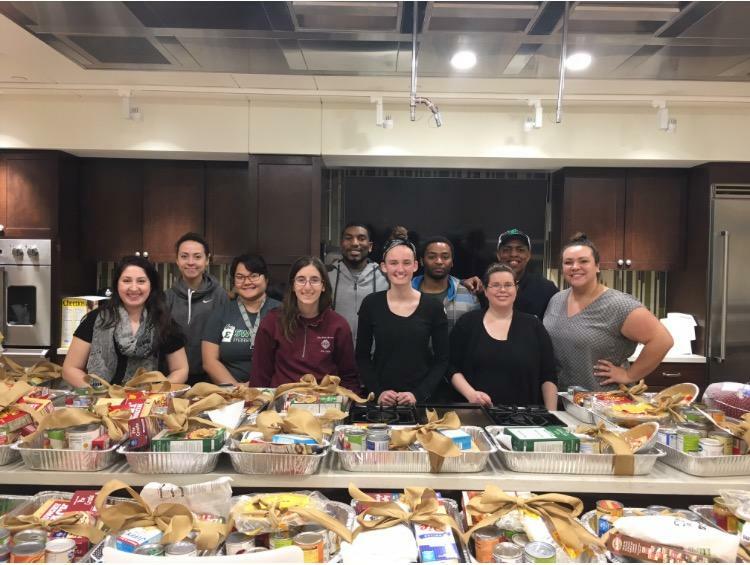 I was on hand when students and staff gathered to put together Thanksgiving dinner food baskets at Eastern Michigan University's "Swoop Food Pantry." 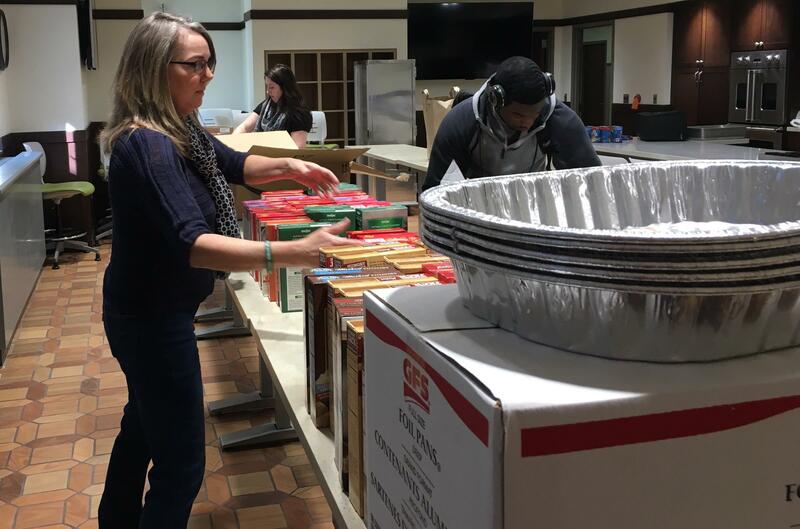 WEMU's Lisa Barry reports on the work done by EMU's Swoop Food Pantry. Volunteers line up at the on-campus student food pantry packing 50 baskets with a variety of traditional Thanksgiving foods. 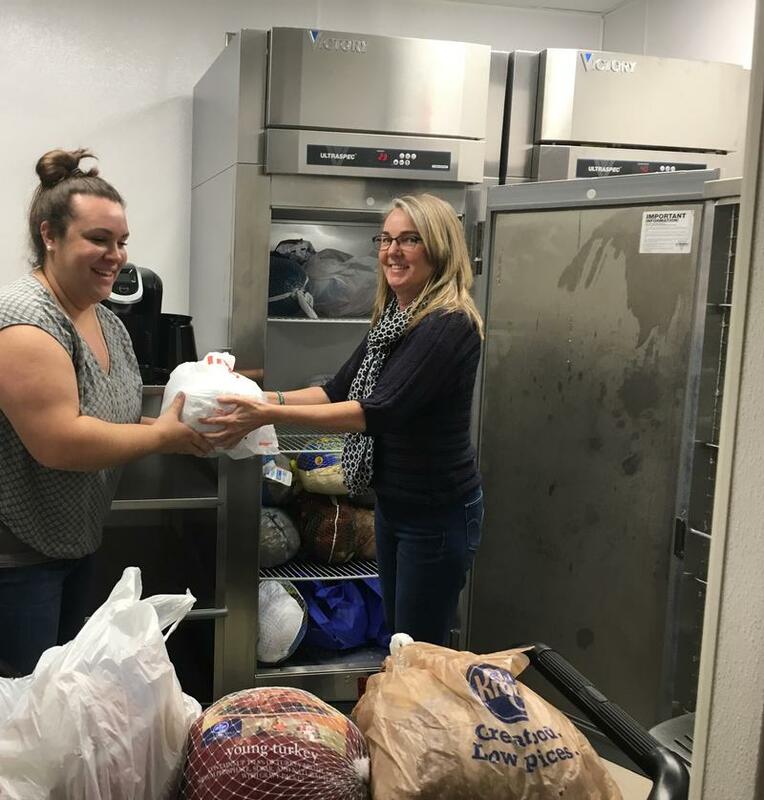 Julie Harkema is the faculty advisor for the Swoop Student Food Pantry. "There's gonna be a turkey, mashed potatoes, stuffing, biscuits, pie crust, pie filling for pumpkin pie, butter, milk, eggs, green beans, and corn." This year, they are putting together 50 Thanksgiving meals with food that has been all donated. That's twice as many as they provided last year. Harkema says the need for food for local college students is growing. 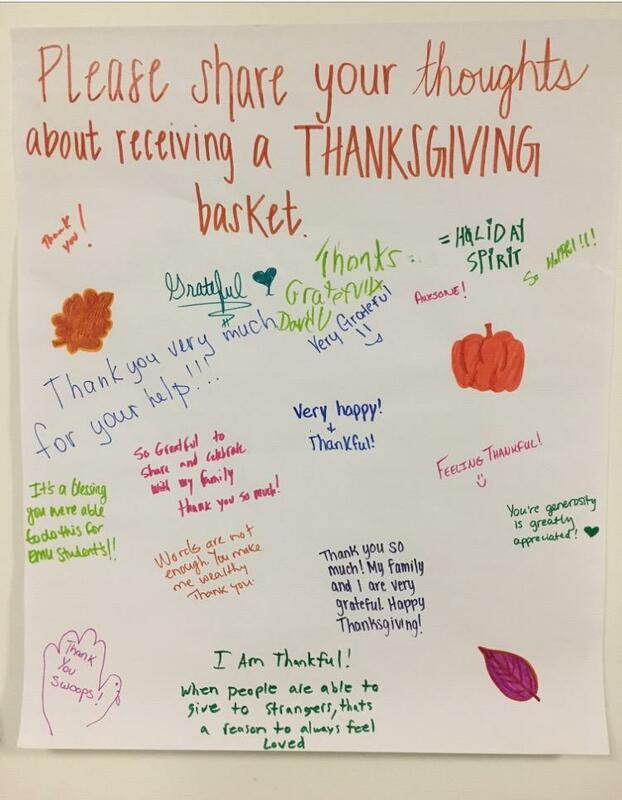 "Some students take these baskets home to their families, who, otherwise, couldn't provide a meal. We had someone last year brought their basket home on a bus, and their family was very grateful. Some students stay around here if they don't have a place to go or can't get home and cook with each other." Alena Angastinoti is an international student from Greece. Thanksgiving is not celebrated there, but she wanted to help her fellow classmates. "I like working with people, and I like making sure that they have quality food for their Thanksgiving dinner." 58,000 college students nationwide report experiencing homelessness on their college financial aid applications, and that is believed to be a low estimate. 22% of the students who take advantage of Eastern's Swoop Pantry say they've experienced housing instability. 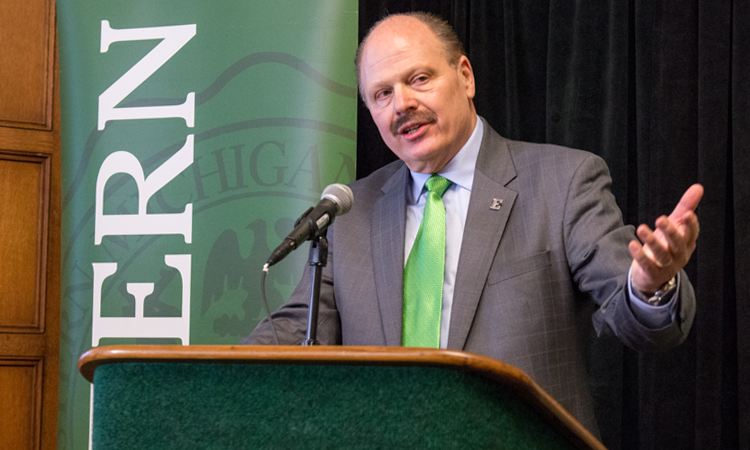 Between several instances of racist graffiti on campus and student and community protests, it's been a tumultuous start for the new president of Eastern Michigan University. 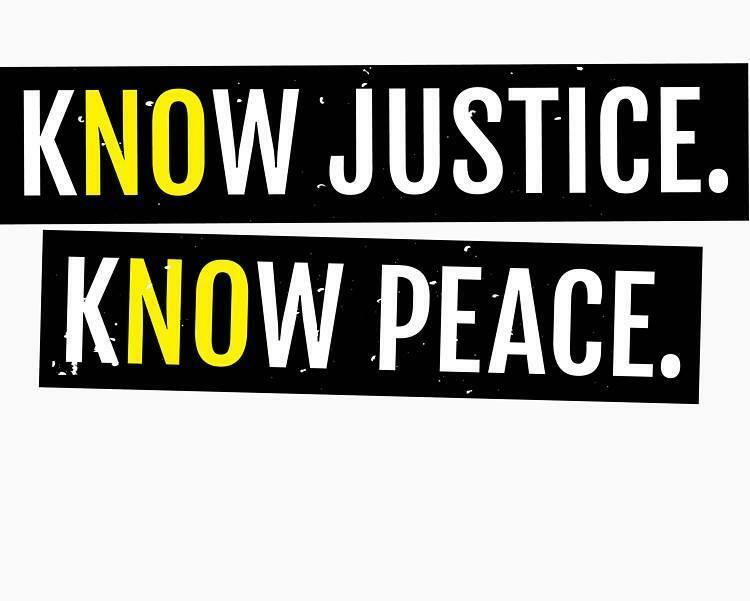 James Smith plans to connect with the community moving forward. WEMU's Lisa Barry reports on EMU President James Smith's upcoming "listening sessions." There will be a day-long event today on the Eastern Michigan University campus to bring the community together in light of several recent racist graffiti incidents on the campus. WEMU's Lisa Barry reports on a day-long teach-in event at Eastern Michigan University. Some members of the Eastern Michigan University faculty and staff are being harassed after participating in a rally last week to protest racist graffiti found on campus. WEMU's Jorge Avellan reports on faculty/staff harassment regarding protests of racist graffiti at EMU.